NASCAR Mexico Series 2017 schedule has been released. The 2017 Peak Mexico Series features a twelve-race calendar slated for Latin America’s top racing series. DAYTONA BEACH, Fla. (Feb. 1, 2017) – The return of the NASCAR PEAK Mexico Series will take the green flag in March in Monterrey, and the 2017 champion will be crowned in November at Mexico City, as part of a 12-race calendar announced today. The schedule for the top racing series in Latin America features a challenging mix of six oval and six road-courses events, and includes stops at nine different venues throughout Mexico. The NASCAR PEAK Mexico Series will open the season at Autódromo Monterrey, a 3.4 km (2.1-mile) road course in Apodaca, Nuevo León, on March 26. Daniel Suárez, a Monterrey native and the 2016 NASCAR XFINITY Series champion, is a two-time winner on the oval layout at his home track. The championship race for the NASCAR PEAK Mexico Series will take place on the 1.63 km (1.013-mile) road-course circuit at Autódromo Hermanos Rodríguez in Mexico City on Nov. 12. The track has been a staple of the series since its inaugural season under the NASCAR banner in 2007. 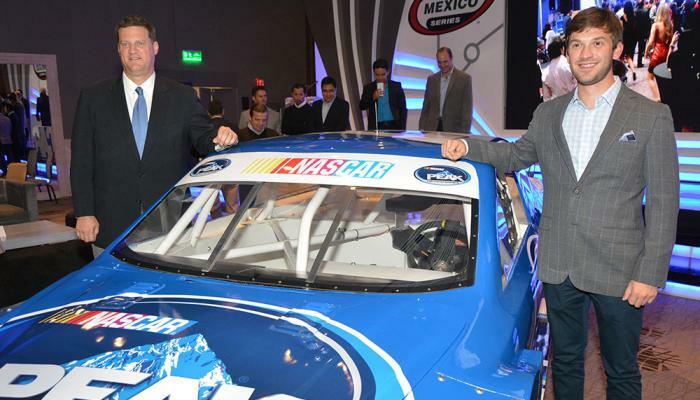 In addition to the NASCAR Mexico Series 2017 schedule, Wednesday’s announcement was also highlighted by the news of the official merger between the NASCAR PEAK Mexico Series and Súper Copa Telcel. The merger ensures the participation of the top drivers in Mexico as the series combine to form the national championship for stock car racing in the country. The NASCAR PEAK Mexico Series television broadcast schedule on will be announced at a later date. View the NASCAR Mexico Series 2017 schedule posted below. The series will make two stops apiece Autódromo Miguel E. Abed in Puebla (May 14 and Oct. 15), and Autódromo Internacional Bernardo Obregón in Guadalajara (June 4 and Sept. 10). The Guadalajara venue is 1.207 km (three-quarters mile) tri-oval. The May race at Puebla will be on the 3.363 km (2.090) road course, while the penultimate race of the season in October will be run on the 2.01 km (1.25 mile) oval. Puebla hosted the 2014 championship race, which was won by Homero Richards and featured the title coronation of Abraham Calderon. Súper Óvalo Chiapas in Tuxtla Gutiérrez will host the Oct. 1 race. The 1.2 km (three-quarters mile) banked tri-oval was the site of the final race of the 2015 season, which saw current NASCAR K&N Pro Series East driver Ruben Garcia Jr. become the youngest champion in series history. The Aug. 6 race site is still being finalized and will be either at Autódromo Potosino in San Luis Potosí or Autodromo Moisés Solana in Pachuca. Potosino, a .804 km (half-mile oval) will also run the series on April 23, while Solano is a 1.75 km (1.08 mile) road course. In addition, the series will travel to Autódromo de León, a 1.2 km (three-quarters mile) road course on June 25; Autódromo Internacional de Aguascalientes, a 1.4 km (.875-mile) concrete tri-oval on July 16; and Autódromo del Ecocentro de la Unión Ganadera, a 1.275 km (.797) oval in Querétaro on Aug. 20.